Some people say there are two different Morocco’s – the rural and the urban. But, I think there are many, many more. For a small country (remember Morocco is only the size of the US state of California) the geographic differences are sometimes overwhelming. The country is divided by mountain ranges, deserts, forests, and some waterways. These natural borders make the differences even more glaring. Traveling from Marrakech to the Sahara, over the High Atlas mountains we knew that there would be several stops along the way. I had visited the Sahara in the southern Morocco but we were headed East so after we reach Ouarzzazate it was all new to me. As the sun set on our first day, after we had left Ait Ben Haddou behind for several more hours on the road, we began to see canyons forming. We drove with giant walls of rock on all directions and the yellow, orange, and red colors that bounced off their surfaces added to the natural beauty. Homes appeared to be affixed to the rock face and I couldn’t help but wonder what happened if some of the rocks came loose? Our van pulled over next to rocks that looked like fingers or marshmallows. Really, I never thought I would be impressed by rocks but these were pretty amazing! Shortly afterwards we headed to our hotel for the night. The rooms themselves weren’t spectacular save for three factors. 1) Heat in the room 2) really really hot showers 3) the view out our window. Our room was on a patio that overlooked the gorge and river below and it really was stunning. K and I were up early before sunrise and went out to sit on the patio with blankets to watch the sun come up over the rocks. I was in awe. He was cold. But, he still talks about that morning with mom so it was worth it! 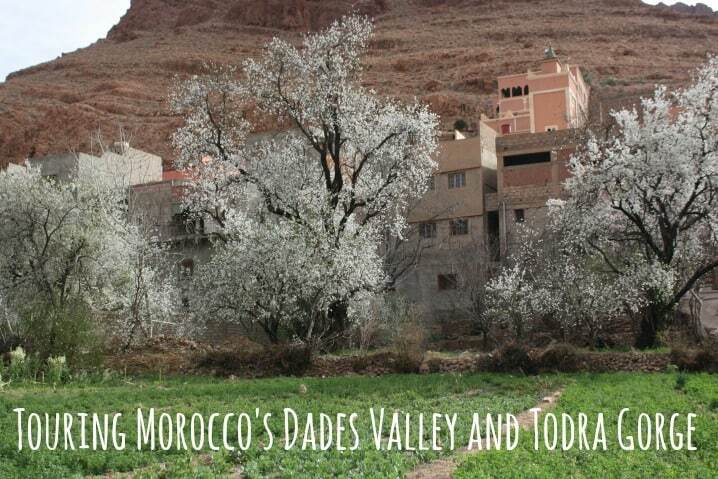 In the morning, after our breakfast of msemmen and local cheese and honey we took a small drive to a community in the Dades Valley (the valley of figs). Remember, this was February and the trees were blossoming! Suffice to say this was like an eden on Earth. It truly is beautiful. Our time in Marrakech has taught me one thing, the value of water. Where there is water, there is life – it is so very evident. We ambled around fields of almonds, cherries, peach, apple, fig, apricot, and probably dozens of others. The fields were green and old fashioned irrigation systems put some of the mechanical set-ups I’ve seen to shame. For most people life is still very traditional. As seems typical with every organized tour I’ve taken in Morocco we were next brought to a rug co-op to see the different styles and designs made here. A woman at a loom was in the room and showed us how the rugs were made by hand. Every woman has a different design and they’re not written down, it’s all in her head so no two rugs will ever truly be the same. (Some advice if you’re buying a rug here – the rugs shouldn’t look too “perfect” remember if they’re made by hand there are going to be some anomolies no matter how skilled the weaver is. If it looks like a machine could have made it, you’re probably right!) I was able to sit down next to the woman and watch her at work. She and I probably had the same level of Arabic skills (she spoke Berber, of which I know 2 words) and so it was an interesting little conversation we had. I think this was my favorite part. We didn’t go home with a rug, but my mom did. You can find a lot of advice online about buying a rug. Keep in mind like most things in Morocco the first price isn’t fixed. There’s an expectation that you’ll bargain for it. Keep in mind the price you’re willing to pay and maybe select a few rugs so that you can find something that will eventually be in your price range. 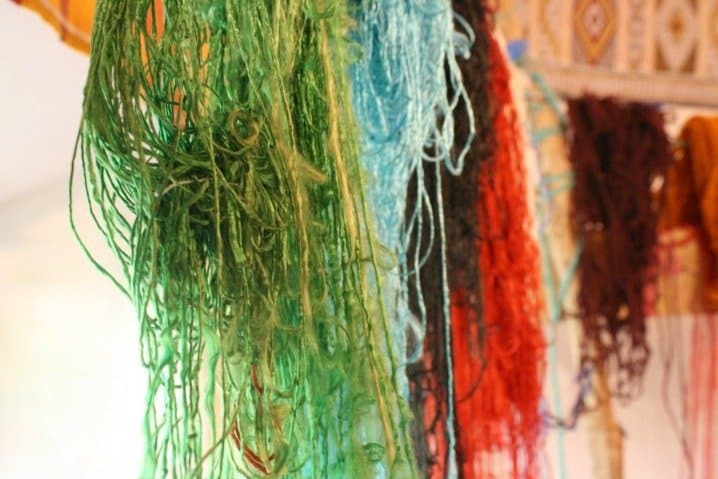 As much as I loved the rugs, because I do really love Moroccan rugs, I loved the yarn even more. The wool comes from sheep, camels, or cactus (agave) and each has a different feeling. 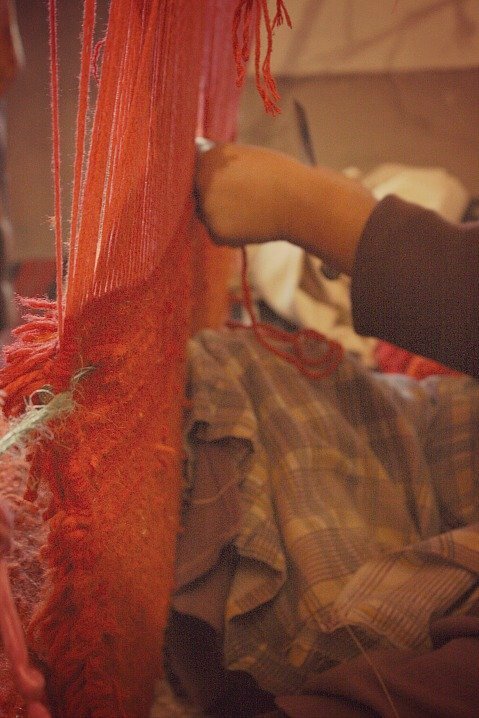 It’s combed to make long threads and then dyed using natural dyes like indigo, poppy flowers, and saffron. All organic rugs! I don’t know what I would have done with all kinds of colorful yarn but I’m sure I could have found a use. Our tour of the area ended as we made our way to the end – and maybe the most dramatic – part of the gorges. The rock walls here were massive and we could see several rock climbers hanging off the sides. You can see me in the picture in comparison to just how tall these canyons are, and we couldn’t get the whole face into the picture. There are more than 150 routes mapped onto the canyon walls (it’s quite popular) with anchors and apparatus in place for those who come to climb. I don’t think I’ll be going up anytime soon! This was my favorite part of our entire trip. I liked it more than being in the Sahara and would have gladly spent more time here than at Ait Ben Haddou. There are many different hiking excursions leaving from this area but I would have been just as happy to have gone home with a family and spent the afternoon in the kitchen cooking or learning how to weave a rug. The kids had fun walking around outside, and even enjoyed learning about how the rugs were made. 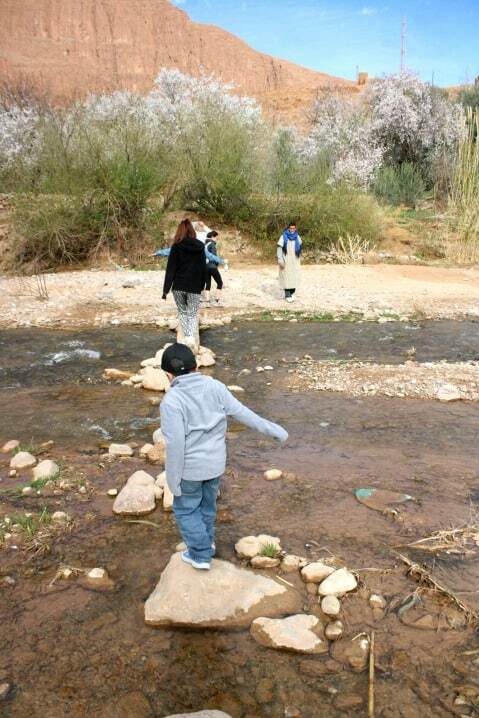 We found no matter where we went our guides were very very good with kids, which is true for most all Moroccans. Kids are welcome and loved. I highly recommend a visit to this area of Morocco. 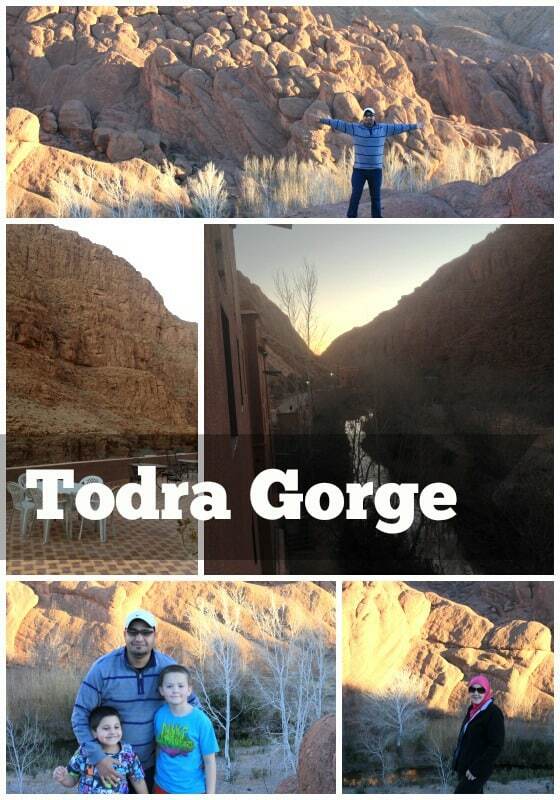 Getting There: Todra Gorges and Dades Valley – 100 km northeast of Ouarzazate before Tinerhir. Depart via car from Marrakech or fly to Ouarzazate for closer departures. Hi 🙂 Great article.. 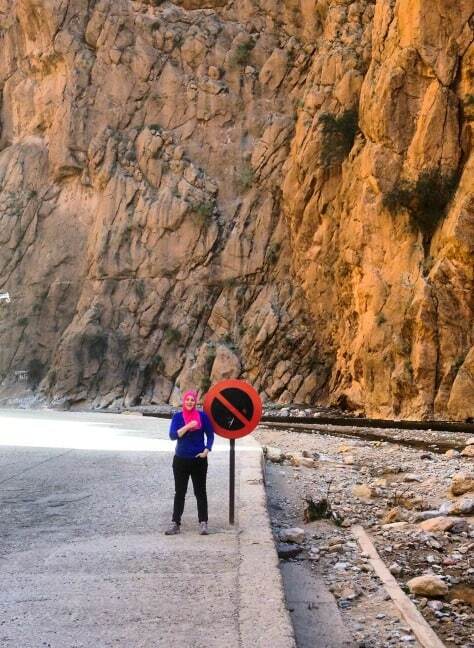 Thanks for sharing… I am goung to Morocco with my family in March… We would love to se how the carpets are made… But we are driving from Marrakech to Merzouga by ourselves… Do you maybe know are there pissibilities for finding a guide somewhere at Dades to take us and show us? I don’t actually have specific info for someone so an option might be to ask at wherever you end up staying along the way – you’ll likely need to spend at least one overnight before Merzouga. They usually have local connections that can get you set up! What is the name of the hotel you stayed at? I have no idea sorry it was one that the tour company arranged! I know this is off topic but I’m traveling to Morocco from the US with my husband this summer and I’ve been getting different answers as to what type of electrical adapter plugs I will need for my appliances. Can you help? Hi – you’ll need the same plug as you would in Europe – two prong! I have seen this amazing gorge and the climbers look like tiny specks as it is so massive. 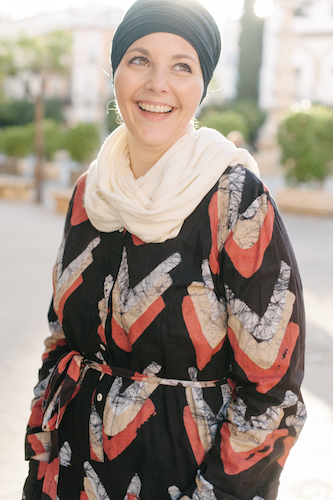 I am loving your blog as I am desperate to come and live in Morocco even if just for a few months. Amanda, Your adventure sounds wonderful. I cant wait to get back and visit again. I so want to be able to travel more in the country and experience all it has to offer. But till then, I will live through you and enjoy it all. Thanks again for sharing the sites, sounds, food, and wonderful handmade crafts that Morocco offers.